Did you know the state tree of Hawaii, the candlenut tree or kukui, can produce oil for biodiesel energy? Oil palm, coconut, jatropha, croton, candlenut, and tallow tree are warm climate trees whose oil from nuts, seeds or fruits can be used to make biodiesel. 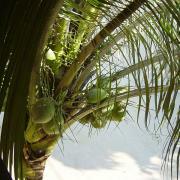 Coconuts grows in most tropical areas. Although the following trees and crops are not generally grown commercially in the United States, American farmers might have heard about them and want to know more. What follows are brief descriptions of several high-yielding or promising warm-climate biodiesel feedstocks. These crops could be grown commercially in warmer areas of the United States. 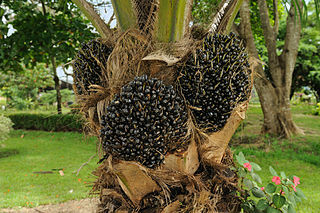 Grown mainly in Malaysia and Indonesia, the oil palm yields the most oil per unit of land of any commercial crop. One metric tonne of oil can be produced on 0.26 hectares of land, according to the Malaysian Palm Oil Council. This equals about 446 gallons of oil per acre. Since 1 gallon of oil yields 1 gallon of biodiesel, this works out to 446 gallons of biodiesel per acre. Interestingly, two different kinds of oil can be extracted from the oil palm: palm oil from the fruit and palm kernel oil from the seed. Both kinds of oil have a high percentage of saturated fatty acids and are solid at low temperatures. These oils are used in many products: cooking oil, shortening, cosmetics, soaps, and candles. Biodiesel made from palm oil has a cloud point of about 17°C. Therefore, pure palm oil biodiesel is unsuitable for colder climates. Palm oil is the main biodiesel feedstock in Malaysia. One contentious issue with palm oil is that, as the global demand grows, there is increasing pressure to clear ecologically sensitive areas such as rain forests to grow more oil palm. The Roundtable on Sustainable Palm Oil aims to promote the growth and use of sustainable palm oil products. 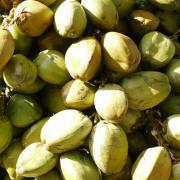 The coconut palm is a domesticated crop that grows in most tropical areas. Coconut fruit. Photo: Martin Zeise, Berlin; Wikimedia Commons. The Philippines is the main producer of coconut oil. For more information on coconut oil biodiesel in the Philippines, see this report by the Global Agriculture Information Network: Philippines Biofuels Annual 2007. The University of Idaho tested a variety of biodiesels for emissions of pollutants. Biodiesels tested included coconut oil ethyl esters (biodiesel made using ethanol) and biodiesel from soy, rapeseed, used hydrogenated soy, and mustard oil. In general, biodiesel emissions are lower than petro-diesel emissions, except for nitrogen oxide, which can sometimes be a little higher. The coconut oil biodiesel produced the lowest level of nitrogen oxides of all the biodiesels tested – 4.5 grams per mile, compared to 6 grams per mile for petro-diesel (Peterson et al., 2000). Emissions of particulate matter were also very low for coconut oil, compared to other biodiesels and petro-diesel (Peterson et al., 2000). Like palm oil biodiesel, coconut oil biodiesel has a high cloud point and pour point, making pure coconut oil biodiesel unsuitable for cold climates. 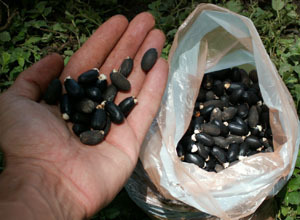 Jatropha curcas is an oilseed tree or shrub that grows in almost all tropical areas. It has been heralded as a new biodiesel feedstock because it is purportedly drought tolerant and disease resistant. As stated in an article in Biofuels, these claims “have triggered a Jatropha hype, with sky-high expectations on simultaneous wasteland reclamation, fuel production, poverty reduction, and large returns on investments” (Achten et al., January 2010). In fact, the article goes on to point out that Jatropha curcas is an undomesticated plant about which very little is known. Jatropha is a non-food plant. Its seeds and oil are poisonous. This poses a problem in terms of producing biodiesel because the seed cake left over after oil extraction cannot be fed to animals. Biodiesel made from jatropha oil has been tested at a cloud point of 8°C. A 2010 report from the United Nations pointed out that jatropha is valuable because of its versatility: it can be used to reclaim degraded lands and as a living fence, in addition to providing oil for fuel and soap-making. 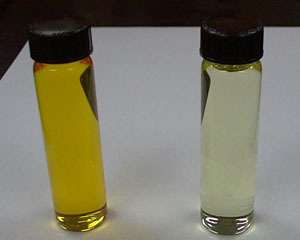 Croton nut oil has been used for biodiesel production in Kenya and Tanzania. The croton tree belongs to the Euphorbia (spurge) family. Crotons grow in almost all tropical areas. Oil from Croton megalocarpus was tested for biodiesel production at the University of Idaho. The oil was found to be suitable for biodiesel. It was unrefined, and the levels of insoluble impurities and unsaponifiable matter were within the normal range compared to traditional biodiesel feedstocks such as soybean oil and canola oil. Croton nut oil and biodiesel. The peroxide value is a test of an oil’s rancidity. 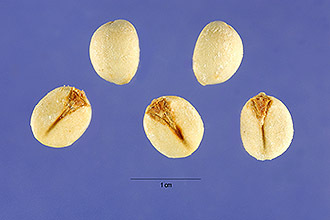 The peroxide value of the croton nut oil tested at the University of Idaho was well below the level of 80 meq/kg (milliequivalents per kilogram) that is considered the threshold for a rancid oil. Since the oil had been extracted under tropical conditions several months earlier, this low value of peroxides indicates that the oil is protected by some level of natural antioxidants. This is another desirable characteristic of a biodiesel feedstock. The free fatty acids were a little high for a seed oil but well within the range that can be processed by traditional alkali-catalyzed techniques. Croton nut oil is similar to safflower oil in that it has high levels of linoleic acid. It has only about 8.5% saturated fatty acids (palmitic and stearic), compared with 14% to 15% for soybean oil, so its low temperature properties should be superior to biodiesel from soy oil. Croton nut meal could be suitable for animal feed. The protein level of the meal was about 22%. This compares with 48% for soybean meal and 30% to 36% for canola meal. The meal was further screened for boron, heavy metals, mercury, organo-chlorine pesticides, and organophosphate/nitrogen pesticides. No indications of any toxic compounds were found in the meal (Van Gerpen, 2006). The candlenut tree (Aleurites moluccana) belongs to the Euphorbia (spurge) family. It is native to Malaysia, Indonesia, the Philippines, and Hawaii and also grows in many other tropical countries. The candlenut tree – also known as kukui – is the state tree of Hawaii. The seeds of this tree are edible. The University of Idaho’s biodiesel program tested candlenut oil at an astonishingly low cloud point of minus 8°C. Many other tropical oils are saturated and have high cloud points. Candlenut oil is very high in polyunsaturates, which gives rise to a low cloud point. For more information on candlenut oil biodiesel, see Biodiesel Production from High Iodine Number Candlenut Oil. The tallow tree (Triadica sebifera, or Sapium sebiferum) is native to China. It was introduced into the United States in the 1700s, possibly as an ornamental. The tree is also called Chinese tallow, popcorn tree, candleberry tree, white wax berry, and Florida aspen. Tallow tree seeds. Image: Steve Hurst @ USDA-NRCS PLANTS Database. often used for food and cosmetics. The tallow tree is a small to medium tree that thrives in the southern United States. It favors wet, disturbed areas. It is listed as an invasive species on the USDA’s National Invasive Species Information Center website because the tree tends to crowd out native species. According to an article from Louisiana State University’s Ag Center, tallow tree can potentially produce more biodiesel feedstock per acre than any other plant except oil palm and perhaps algae. The tallow tree could be an ideal biodiesel feedstock because it grows in areas unsuitable for farming, has few pests and diseases, and does not need many nutrients (Breitenbeck, 2008). Louisiana State University professor Gary Breitenbeck cautions that the oil yield from tallow trees varies enormously. Some trees produce only a cup of seeds, and others produce much more. Breitenbeck is in the process of selecting and breeding the highest-yielding trees. Because the tree can be invasive, many experts are reluctant to introduce the tree into new areas until the spread of the tree can be controlled. Achten, W.M.J., L.R. Nielsen, R. Aerts, A.G. Lengkeek, E.D. Kjaer. A. Trabucco, J.K. Hansen, W.H. Maes, L. Graudal, F. K. Akinnifesi, and B. Muys (2010). Towards Domestication of Jatropha curcas. Biofuels, January 2010, 1(1), 91-107. Breitenbeck, Gary A. Chinese Tallow Trees: A Potential Bioenergy Crop for Louisiana. Louisiana Agriculture Magazine, LSU AgCenter, Summer 2008. Peterson, C.L., J.S. Taberski, J.C. Thompson, and C.L. Chase (2000). The Effect of Biodiesel Feedstock on Regulated Emissions in Chassis Dynamometer Tests of a Pickup Truck. Transactions of the ASABE, Vol. 43(6):1371-1381. Van Gerpen, Jon (2006). Investigation of the Suitability of Croton Nut Oil for Biodiesel Production. Unpublished report. Handbook of Plant-Based Biofuels, edited by Ashok Pandey (CRC Press, 2009) contains articles on making biodiesel from many tropical oilseed crops, including palm oil, jatropha, rice bran oil, karanja, mahua, and rubber seed oil.